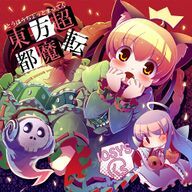 Touhou Wait A Moment (東方超都魔転, Touhou Chotto Matten) is a doujin album by IOSYS released on 2009-03-08 (Reitaisai 6). It features vocal and instrumental arrangements of themes from Embodiment of Scarlet Devil, Perfect Cherry Blossom, Immaterial and Missing Power, Imperishable Night, Phantasmagoria of Flower View, Subterranean Animism and Strange and Bright Nature Deity. Touhou Just A Moment! Episode 2/Stop! Yuyuko-sama! The title would normally be read as "chōto maten" rather than "chotto matten" ("Wait a sec"). This is a joke stemming from when the sixth Reitaisai, the biggest Touhou Project fan event, was going to be held ahead of regular schedule, and the members of IOSYS were in hurry. Track 02 is a parody of Zetsubou Billy by Maximum the Hormone. Track 03 is partially a parody of Love Dial 6700 by Finger Five. Track 05 is a parody of Shuuchishin (Sense Of Shame) by Shuuchishin, although the name of title and content of lyrics are similar to Hisoukan (Pathetic) by Hisoukan, the group inspired by them. Bow Down, You Ignorant Fools! Track 11 is an homage to the song "Hitori" sung by Gospellers. Track 12's title and skit heavily reference the Gyakuten Saiban (Turnabout Trial) series of games, better known in America as the Phoenix Wright/Ace Attorney series. This page was last edited on 7 July 2017, at 17:33.